Hanukkah (also commonly spelled as Chanukah, Hannukah, Hannukkah, and Channukah) means “dedication” in Hebrew. The festival - which lasts eight days every year but, because it is based on the Hebrew calendar, is not celebrated on the same dates each year - marks the victory of the Maccabees over the armies of Syria and the liberation of Jews and rededication of the (second) Temple in Jerusalem. Since the Maccabee triumph in 165 B.C.E., Hanukkah and how it is marked by Reform Jews has evolved. Our Congregation hosts an annual dinner/party and encourages families to recognize the Festival of Lights in their own homes. 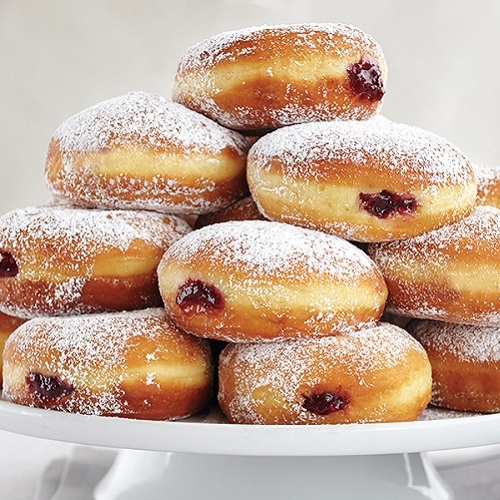 Hanukkah centers around the lighting of the hanukkiyah, a special menorah for Hanukkah; foods prepared in oil including latkes (potato pancakes) and sufganiyot (jelly doughnuts); and special songs and games. Our annual Hanukkah dinner and party will be held on Sunday, December 2 at 6:30 PM. A joint celebration with our friends at Ahavath Achim - The Hebrew Congregation of Wichita, we’ll have traditional foods, fun and games, and a performance from our own Mazeltones choir and Wichita Rhythm and Jews Klezmer band. Age-based costs are - 0-5, Free. 6-12, $3. 13+, $5 (max of $20/family) and all attendees are asked to bring a clean coat, clean gloves, or a new hat to donate to Wichita’s Operation Holiday. Like most Jewish holidays, festivals, and celebrations there are a few central themes to Hanukkah. The most popular trends for Hanukkah are light, miracles, and oil - in the form of fried food. No two Jews celebrate the Hanukkah exactly the same but there are lots of common ideas and symbols one can anticipate. Learn more by clicking below. Many Jewish homes will use a Hanukkiyah - a Hanukkah menorah with nine spaces for candles/oil cups - to commemorate each night of the festival. One of the spaces will be different/set-apart/elevated from the others - that holds the shamash (helper/slave candle). Traditionally candles/oil are ADDED each night from right to left but LIT (using the shamash) left to right. There are two blessings for each night of Hanukkah with a third blessing on the first night. Hanukkiyah are generally displayed in a place of prominence - often on a mantel or window sill facing the street or in a public place.